Jeff Granger was born on Thursday, December 16, 1971, in San Pedro, California. 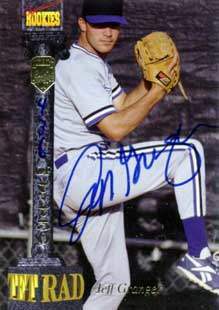 Granger was 21 years old when he broke into the big leagues on September 16, 1993, with the Kansas City Royals. His biographical data, year-by-year hitting stats, fielding stats, pitching stats (where applicable), career totals, uniform numbers, salary data and miscellaneous items-of-interest are presented by Baseball Almanac on this comprehensive Jeff Granger baseball stats page. Did you know that you can compare Jeff Granger to other rookies who also had their Major League debut during the 1993 American League season ?